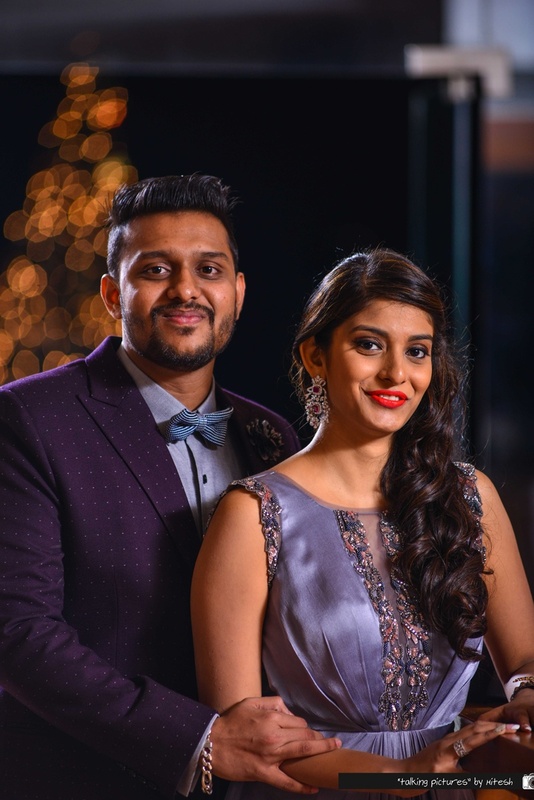 As different as chalk and cheese, Karan and Natasha realized their love for each other over a movie date where neither of them watched the movie! 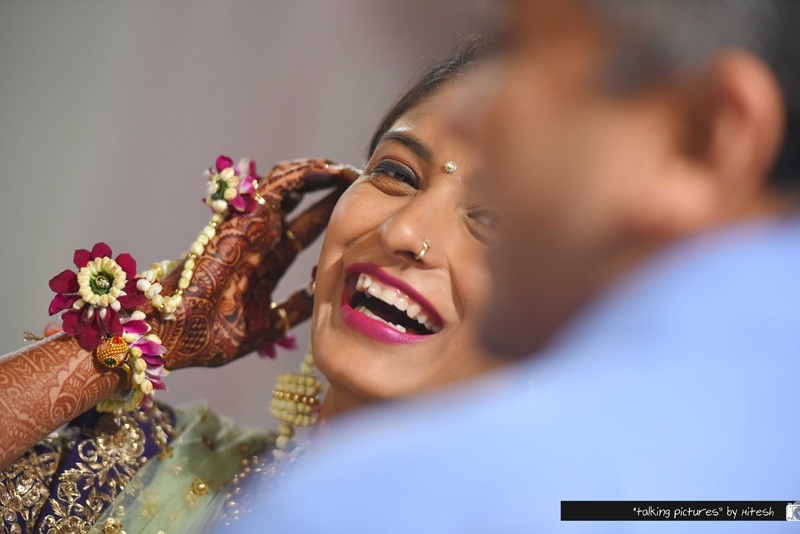 Bitten by the love bug, there was no going back for the two of them. 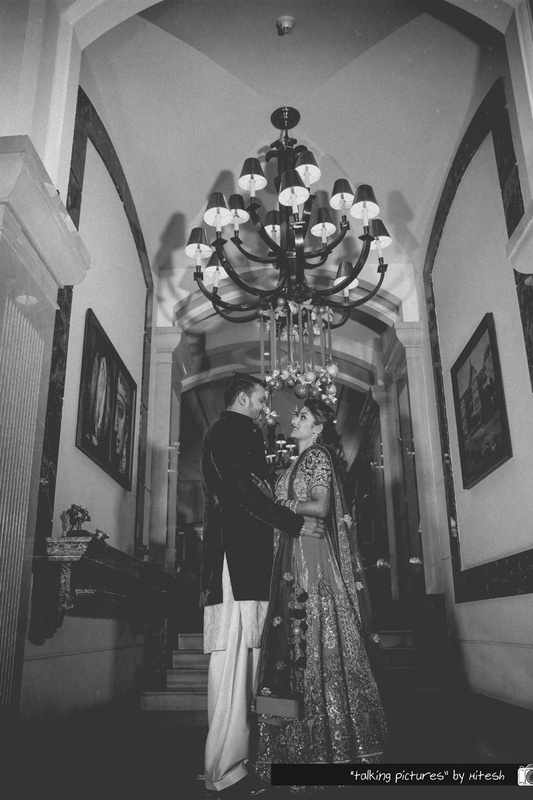 They had a four day long Mumbai wedding spread accross ITC Grand Central, NSCI and many more locations. 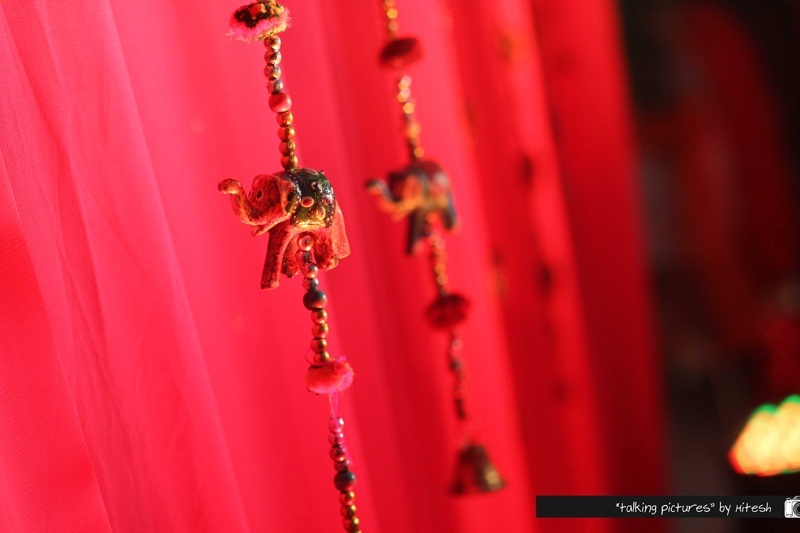 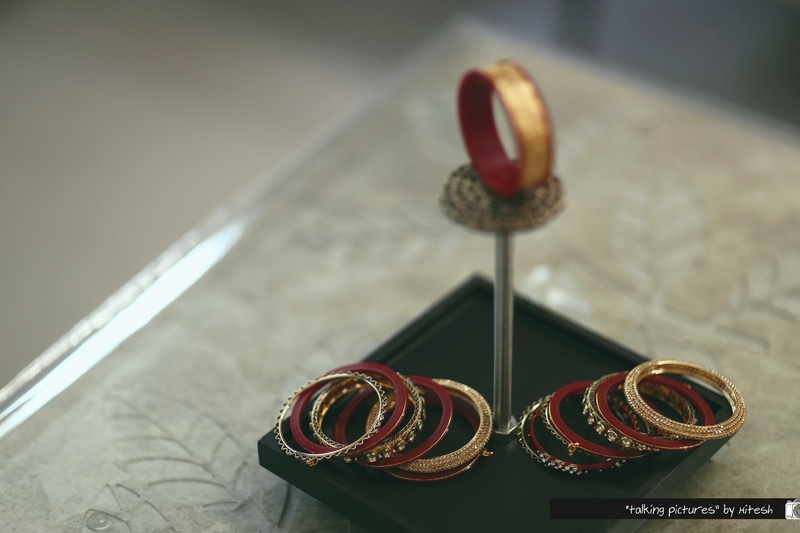 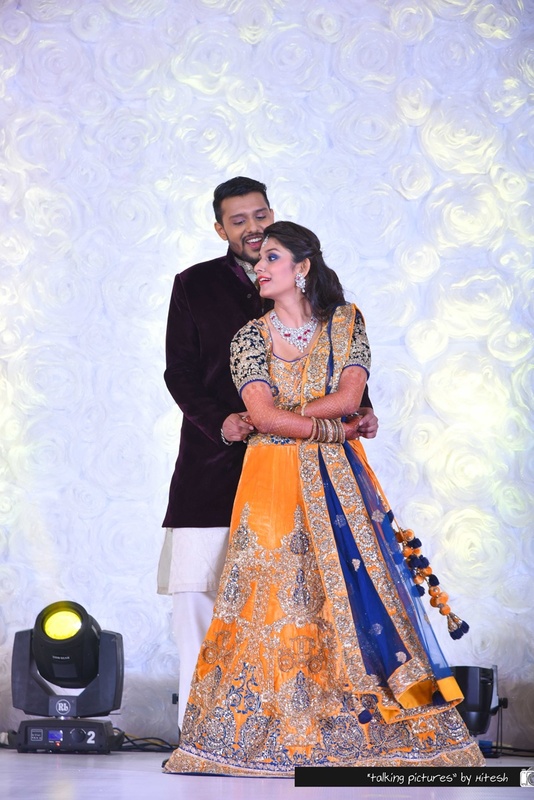 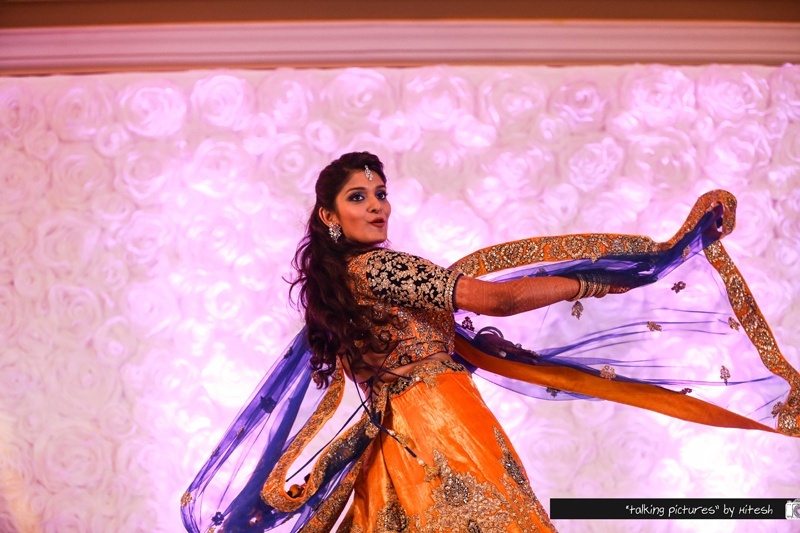 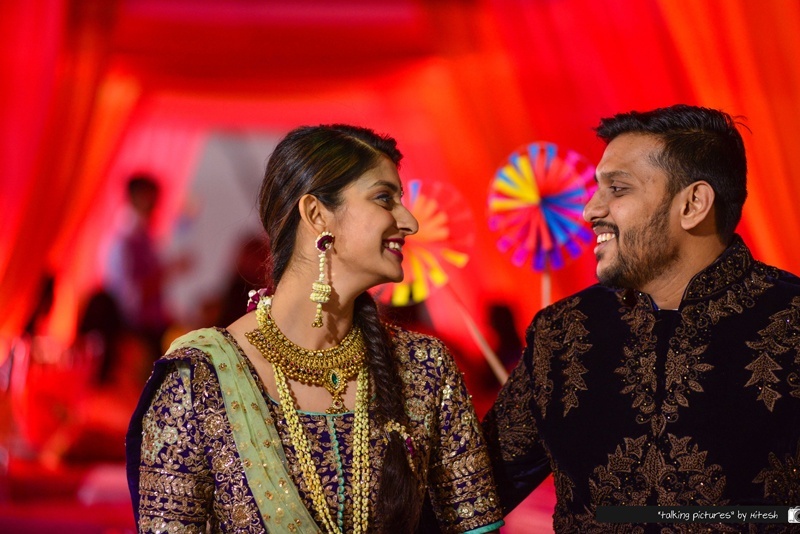 Full of naach-gaana, inspirational decor and gorgoeus outfits - their wedding had that destination wedding feel, even though it was based in mumbai. 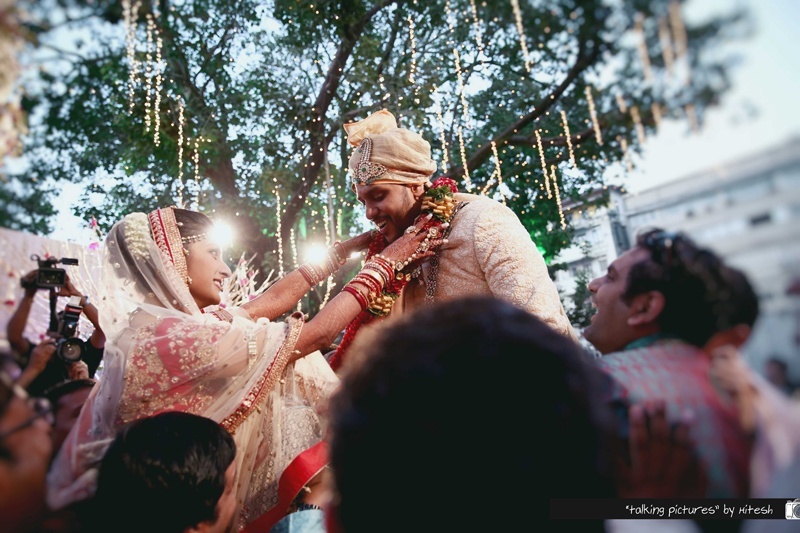 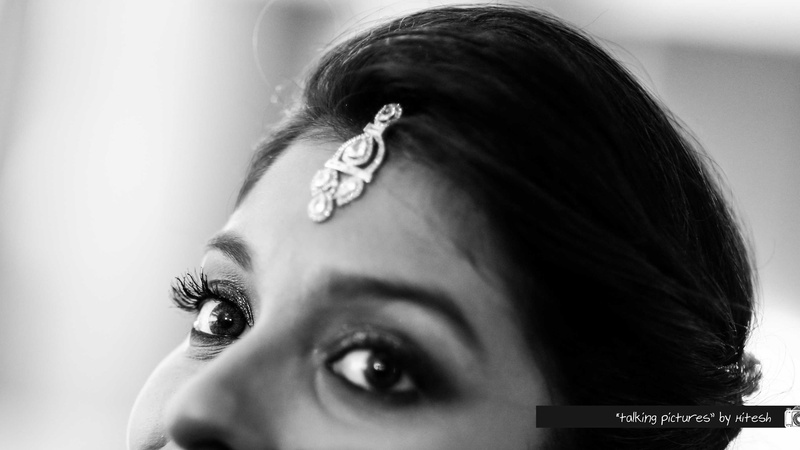 Talking Pictures by Hitesh shot this wedding brilliantly for this stunning couple to hold close forever. 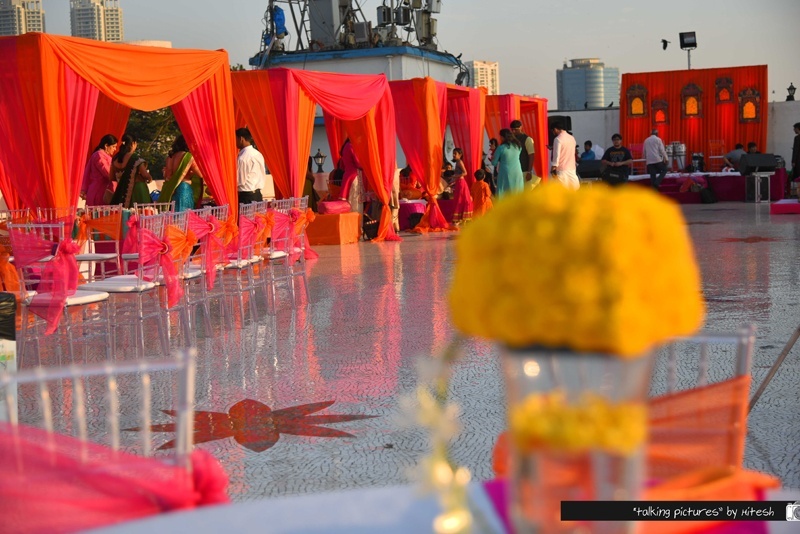 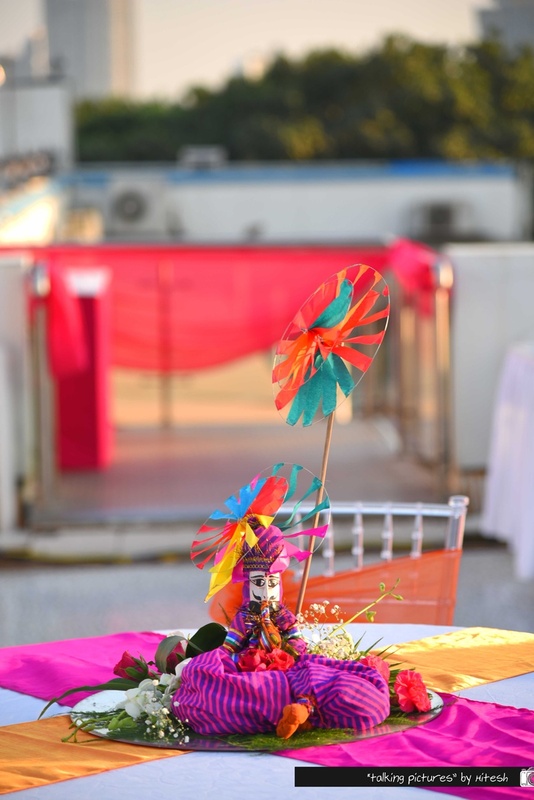 The celebrations began at the terrace top Mehndi ceremony held at NSCI, Mumbai which was full of color and pretty décor elements. 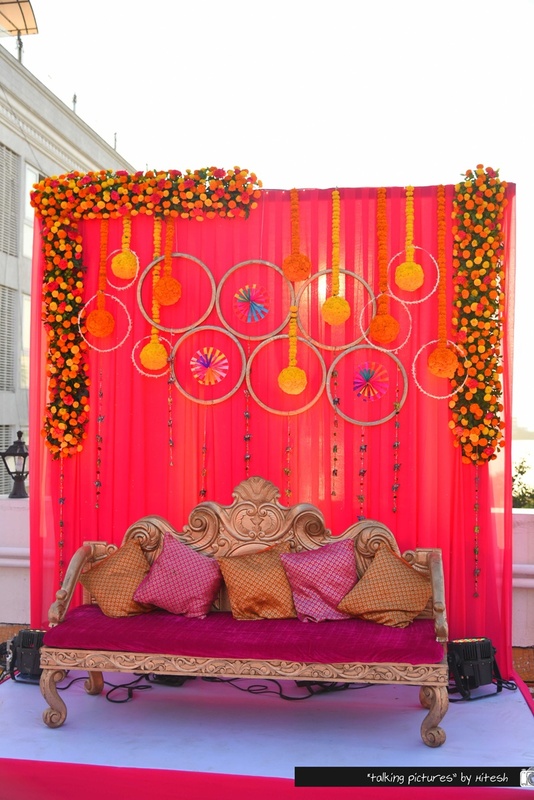 Fuchsia and orange hues drapes with crystal chivari’s graced the sparkly white mosaic floor beautifully. 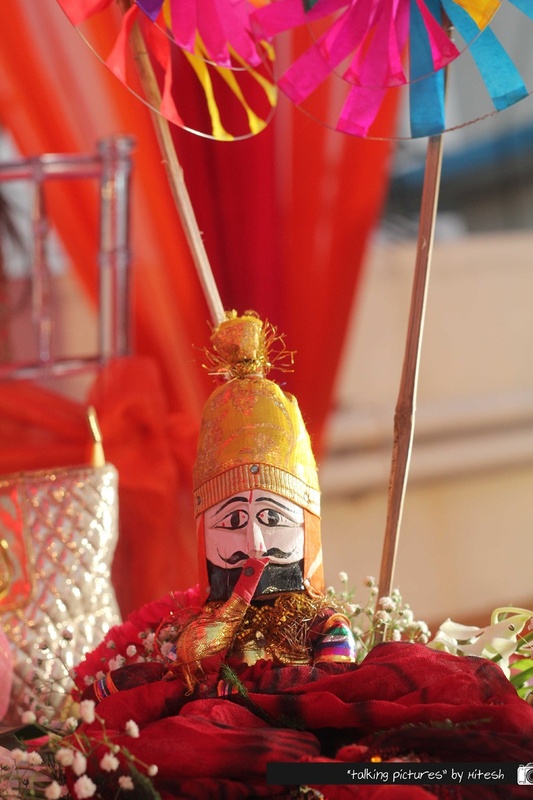 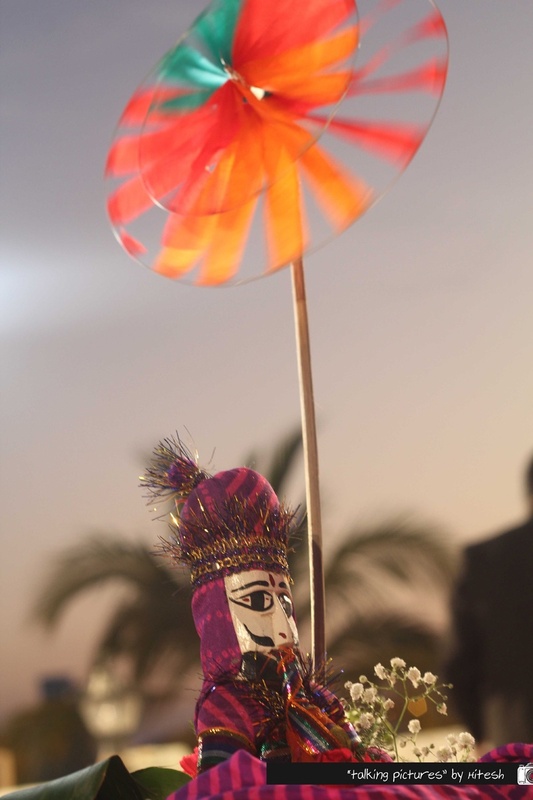 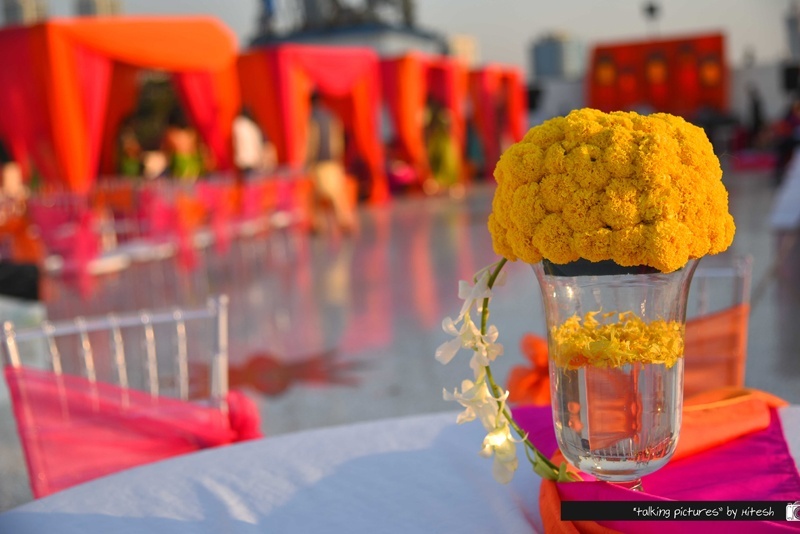 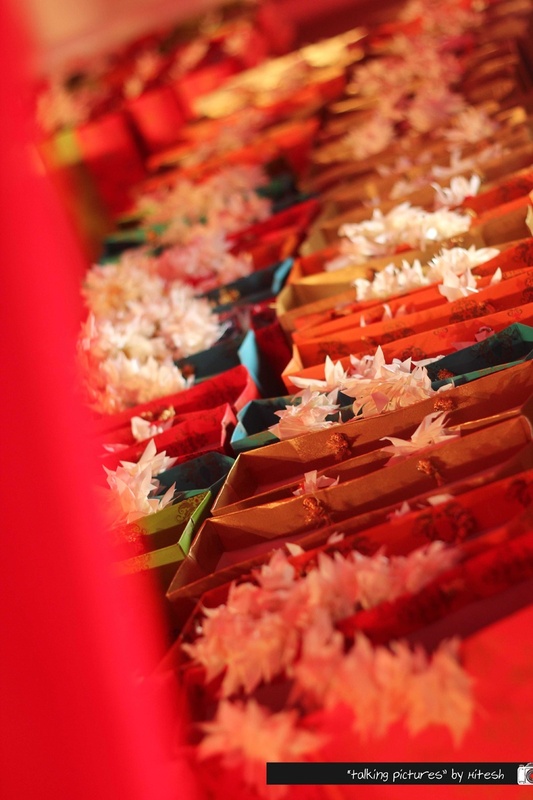 Each table centerpiece had a crystal flask adorned with Marigold flowers and gladioli or ethnic rajasthani dolls with colorful pinwheels – all in all it was a bright beautiful day time affair! 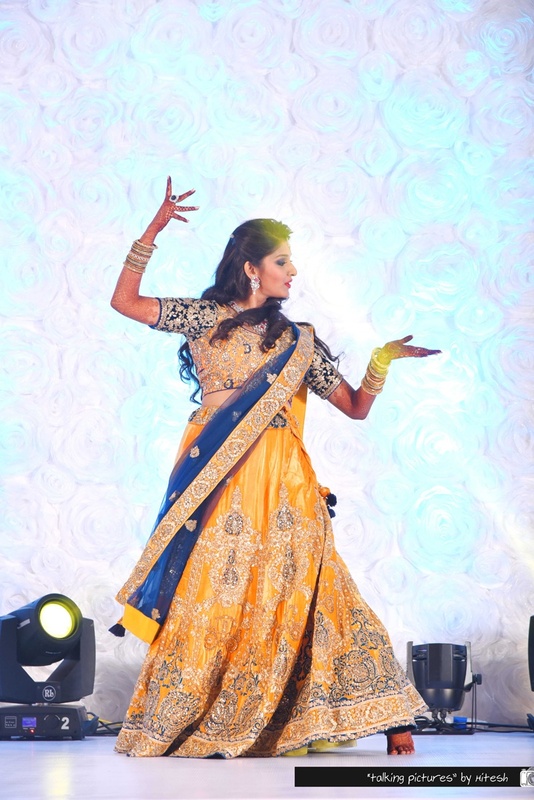 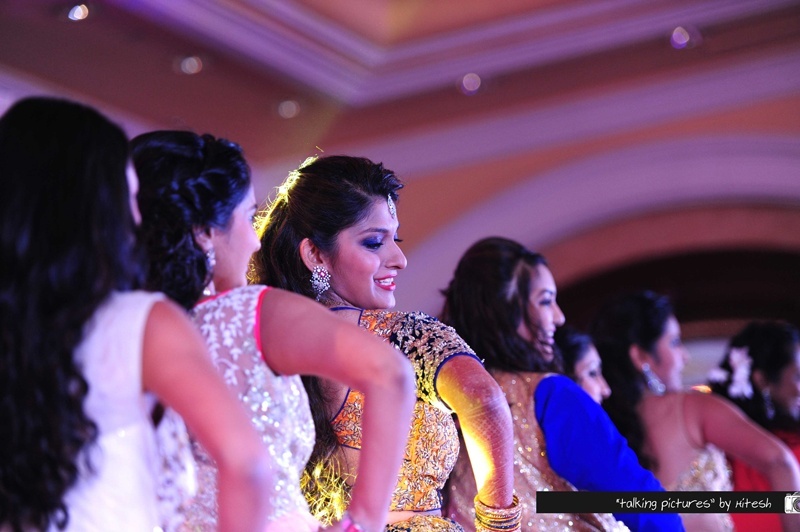 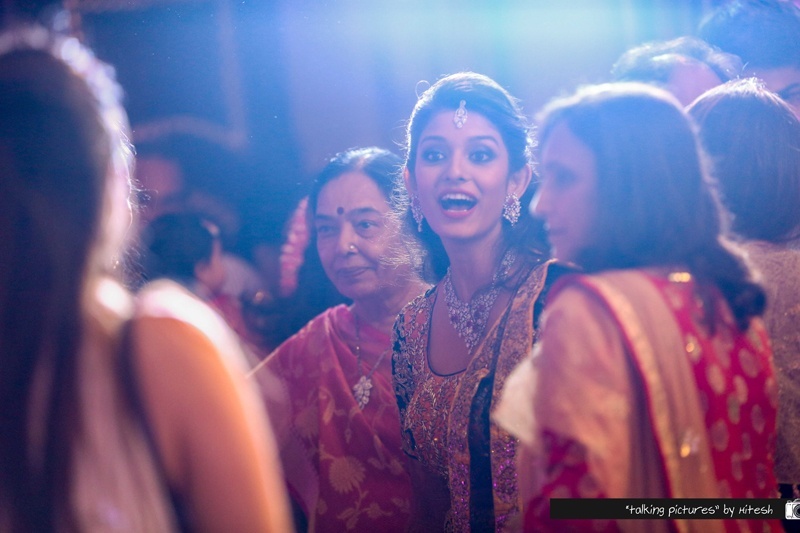 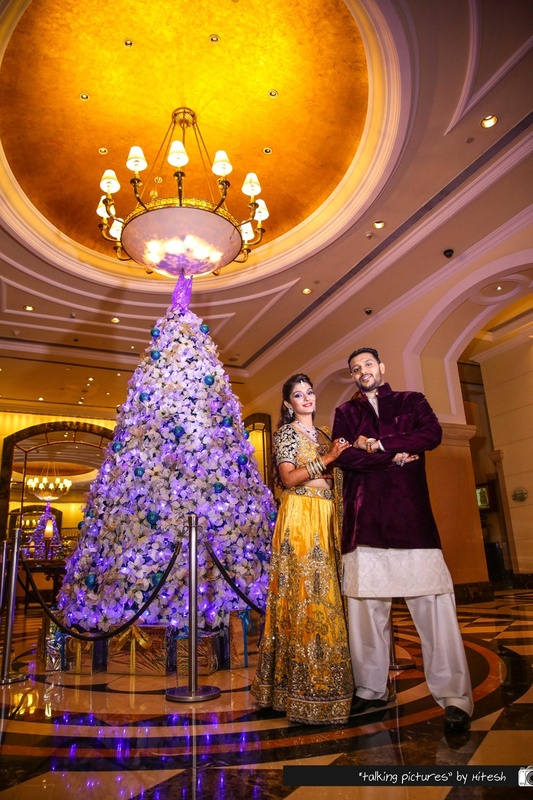 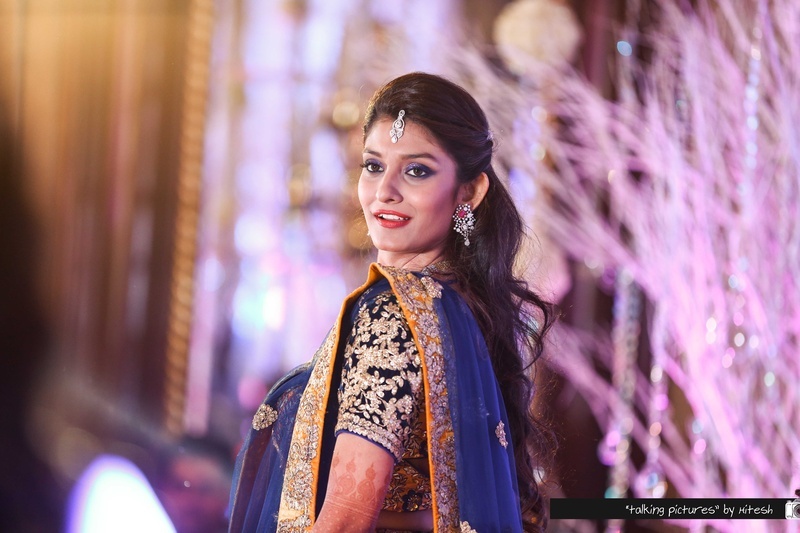 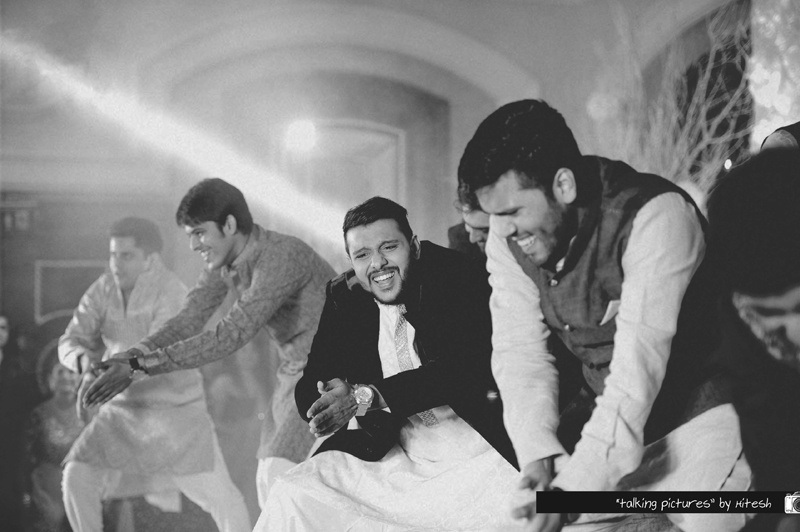 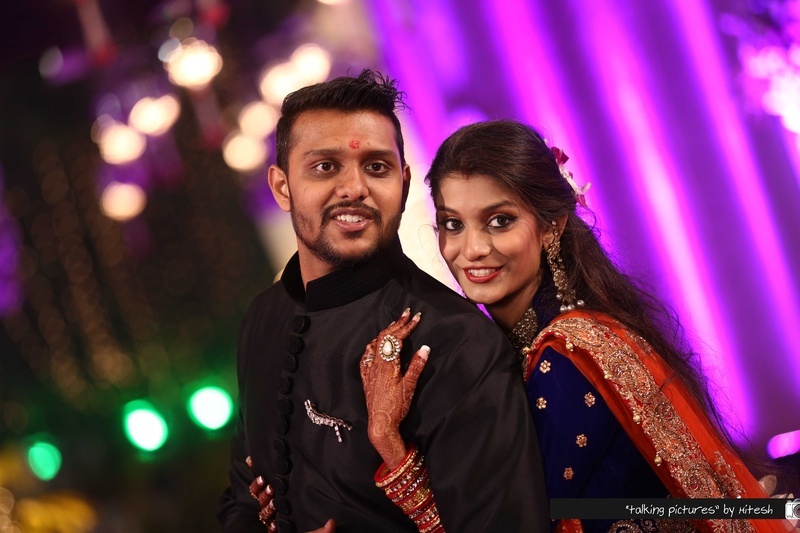 Held at the opulent ITC Grand Central, their sangeet was chic, contemporary and classy. 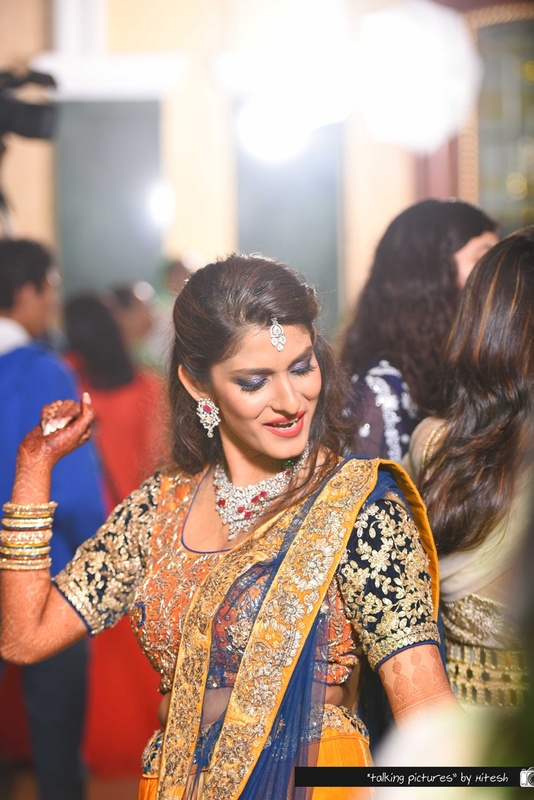 Dressed in a navy blue and orange lehenga embellished with resham embroidery, sequins, and zardozi, Natasha was an absolute stunner! 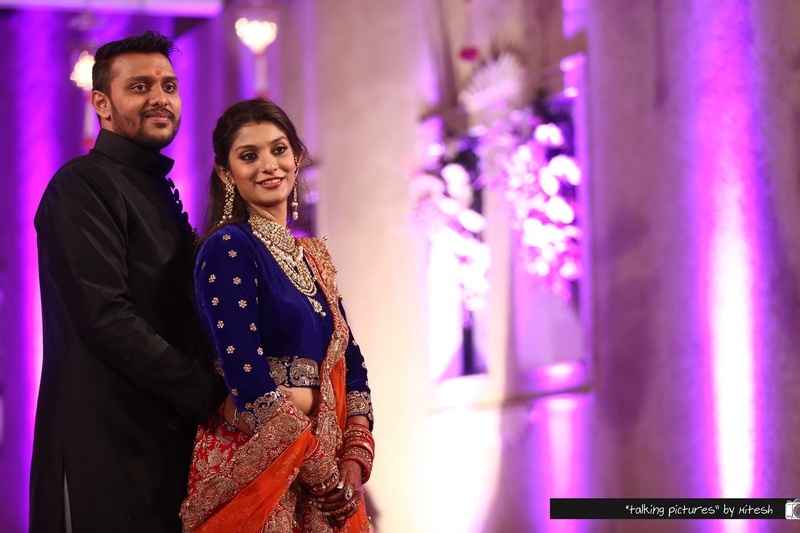 Karan too looked his dapper best in a burgundy velvet sherwani. 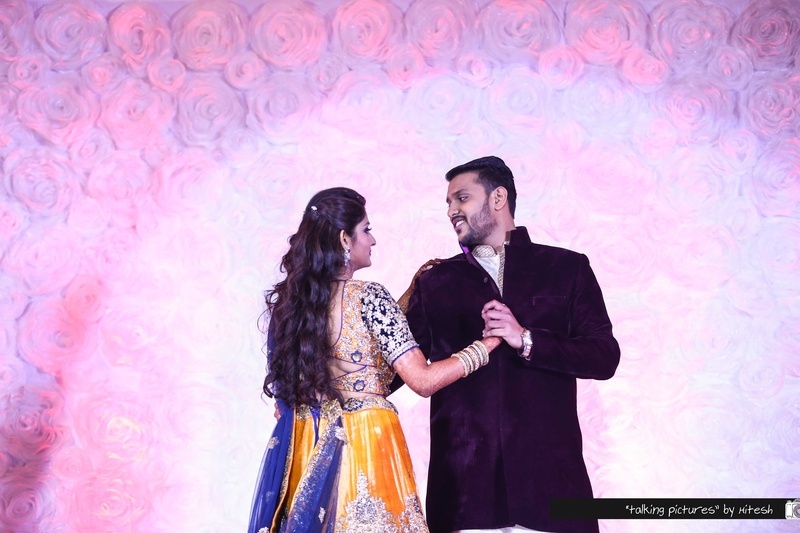 What caught our attention at this Sangeet was their stage backdrop – they didn’t go for a LED screen or drapes and flowers but opted to have a blush pink rose texted floral wall instead – a shift in design that we so adore! 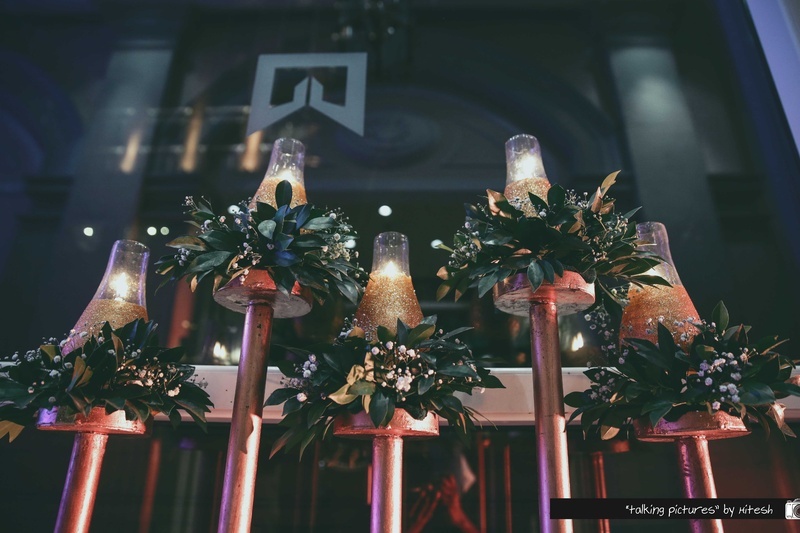 The grooms outfit at the cocktail completely stole the show! 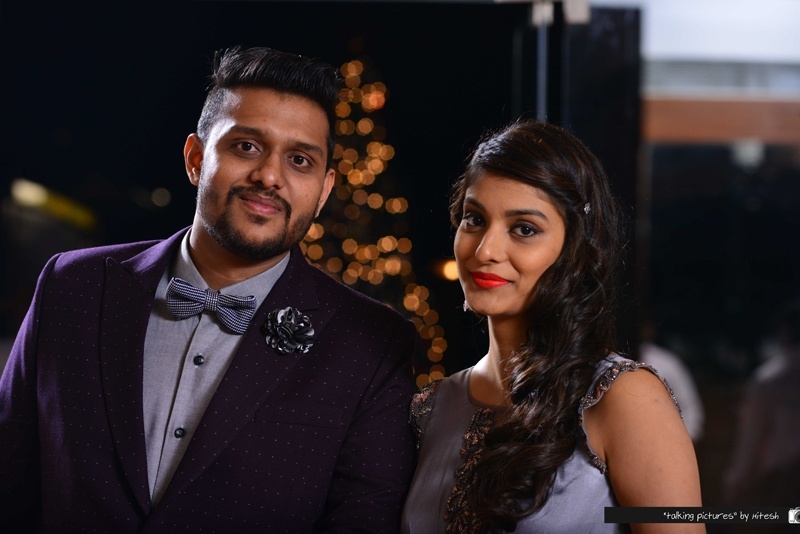 Karan’s outfit was young, fresh yet classy. 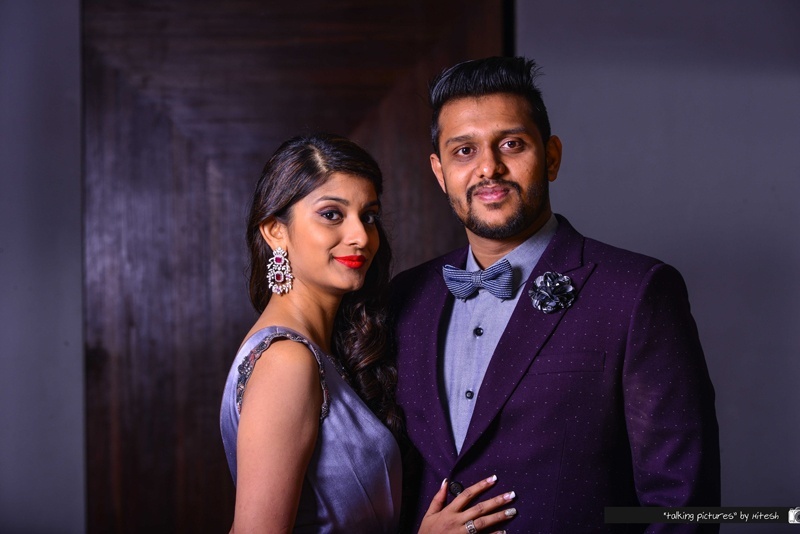 He wore a polka dotted blazer with a textured grey shirt styled and bow-tie – we are liking this change from the classic black tux! 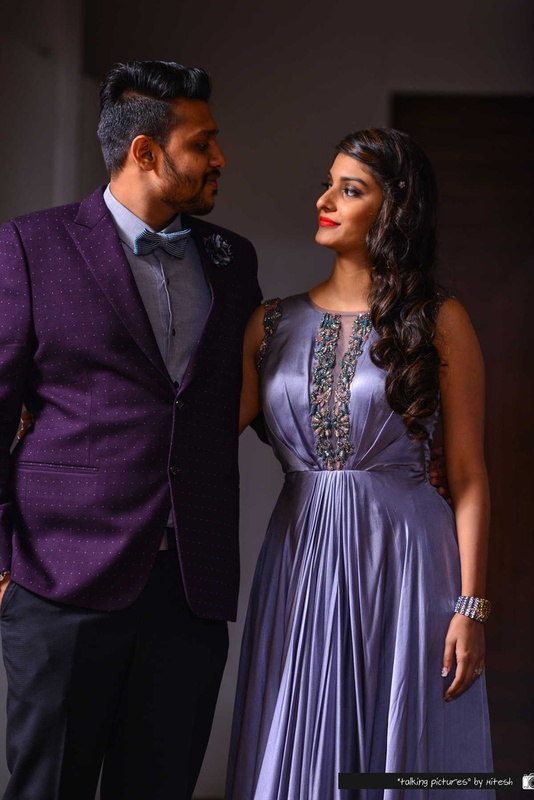 Natasha looked ravishing in a flowy cocktail gown, stitched in a regal hue of grey – perfect for an intimate, classy evening affair. 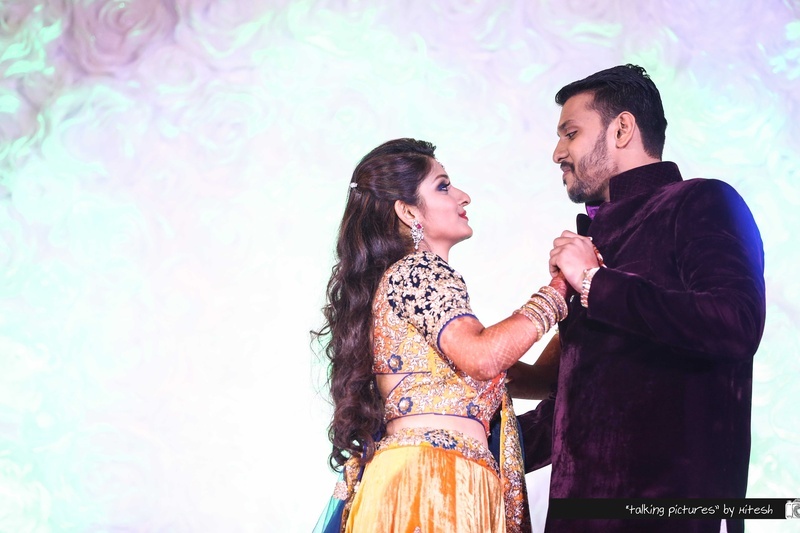 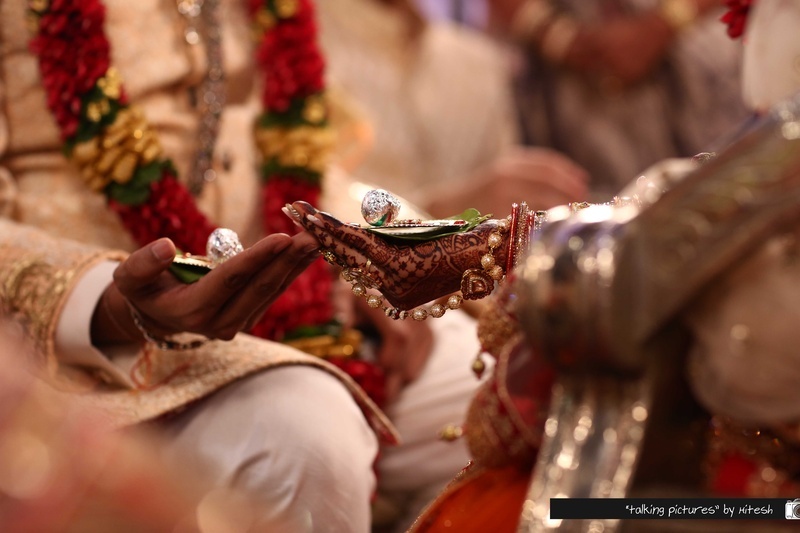 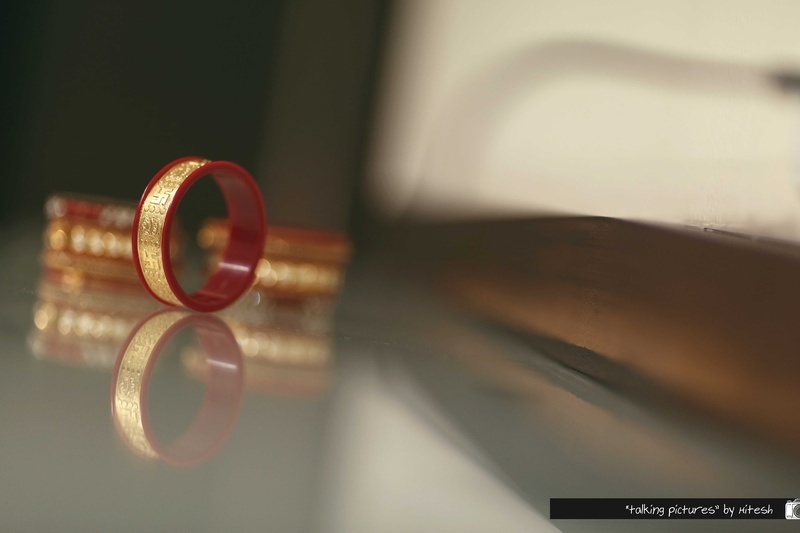 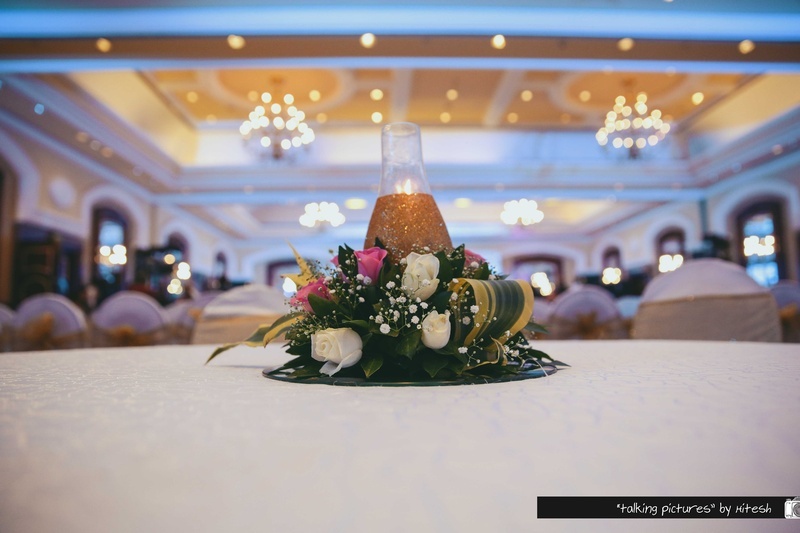 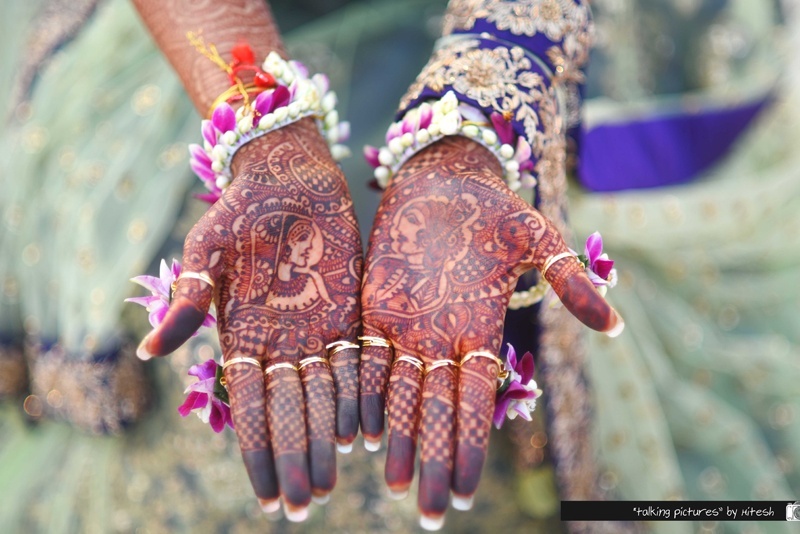 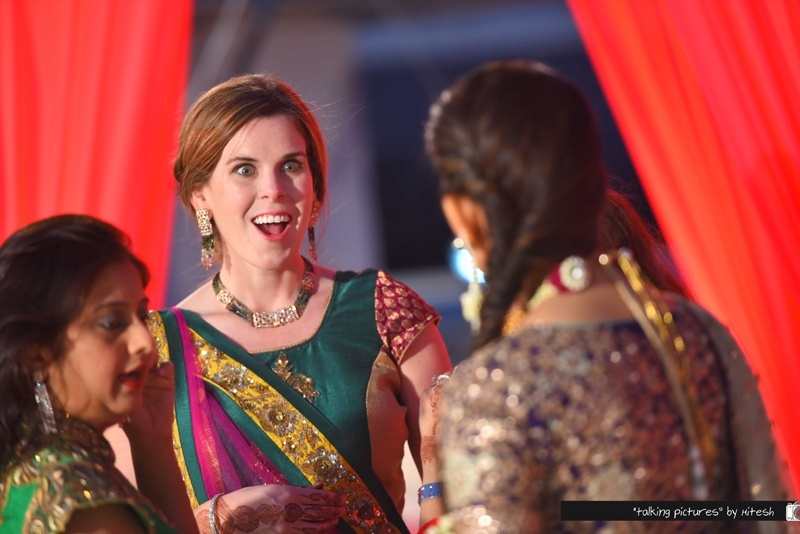 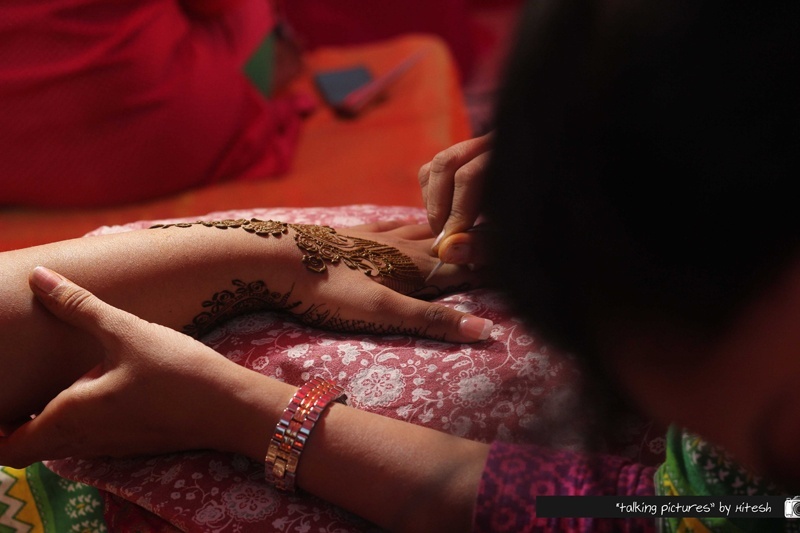 With each passing pre-wedding function, the grandiosity factor seemed to just level up, and we were sure that the final wedding day would leave a lasting impact on us. 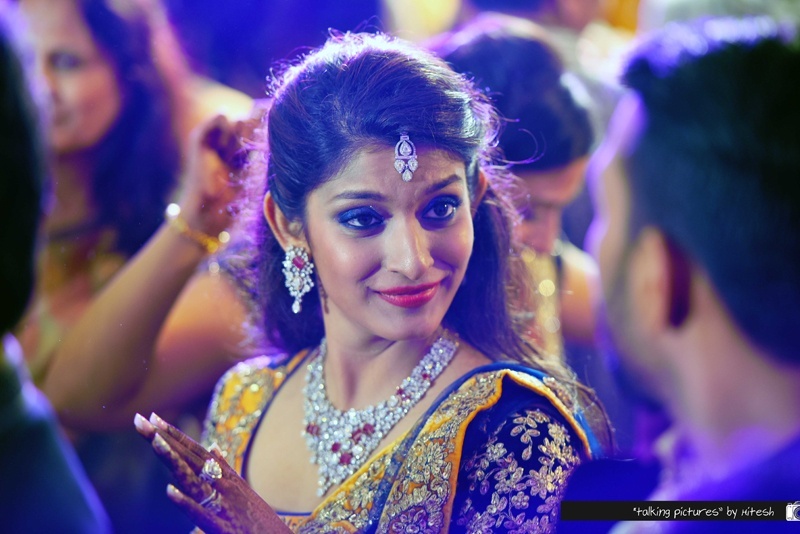 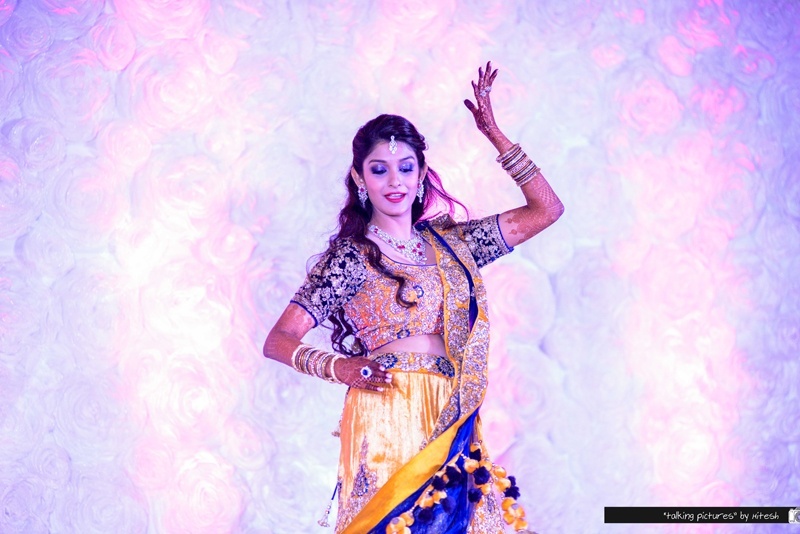 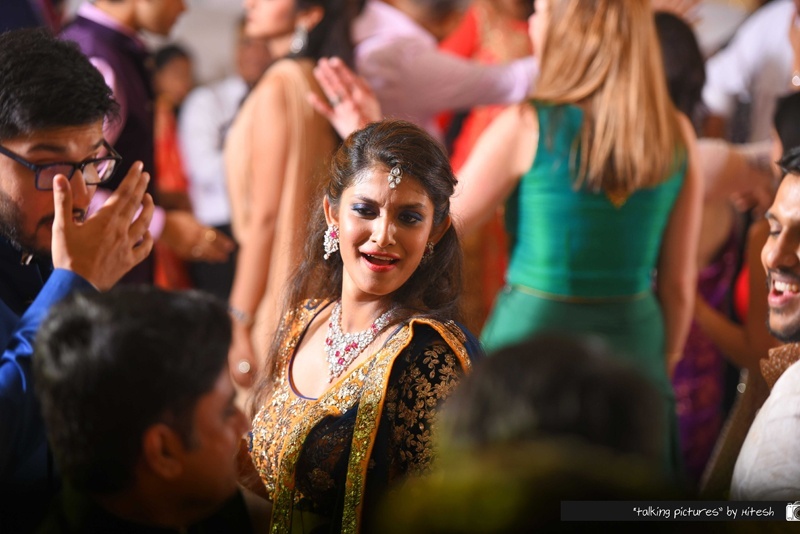 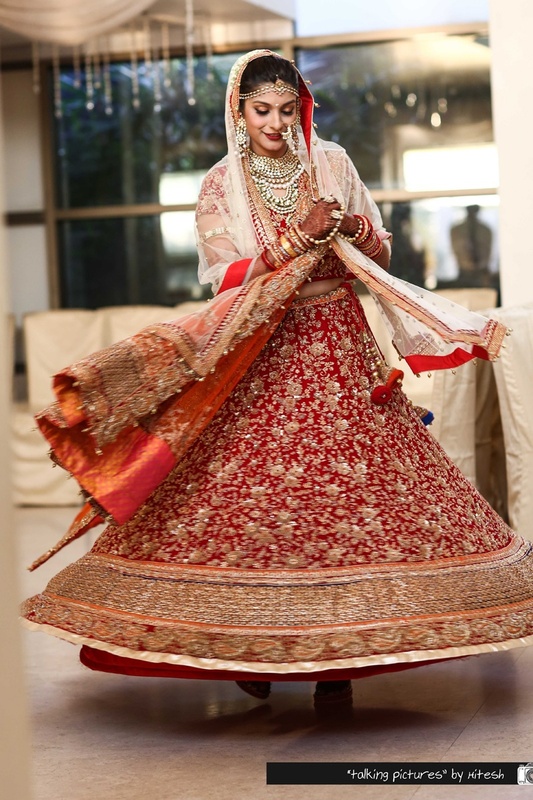 Natasha entered Thackers Banquet, Girgaum dressed in a classic red wedding lehenga embellished with floral gold sequined motifs, she looked like a quintessential Indian bride. 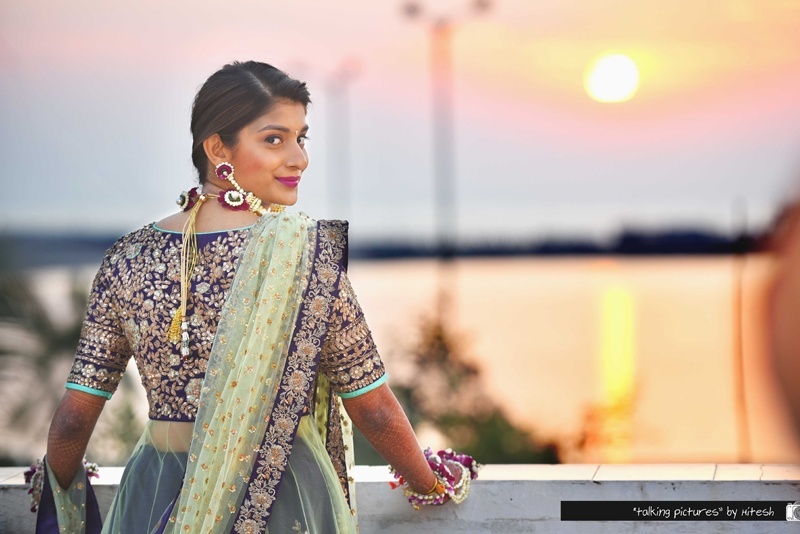 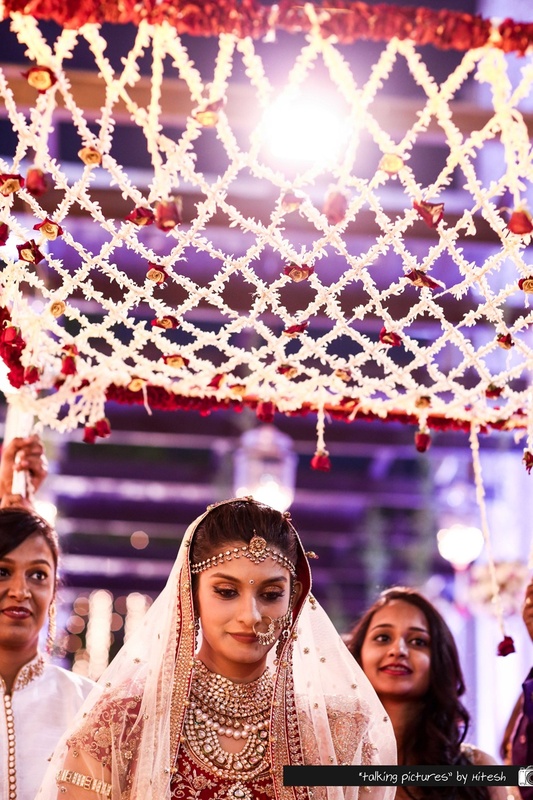 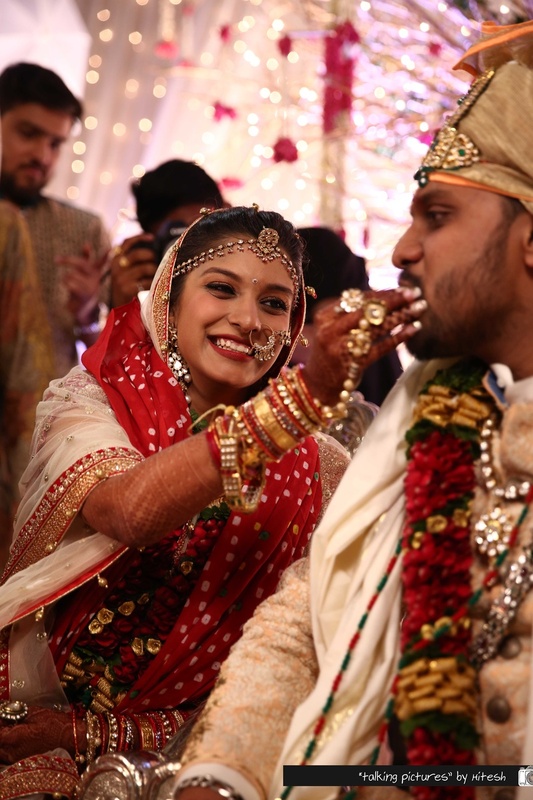 While her double draped dupatta and polki studded wedding jewellery only added bouts of prettiness that made her overall look even more perfect. 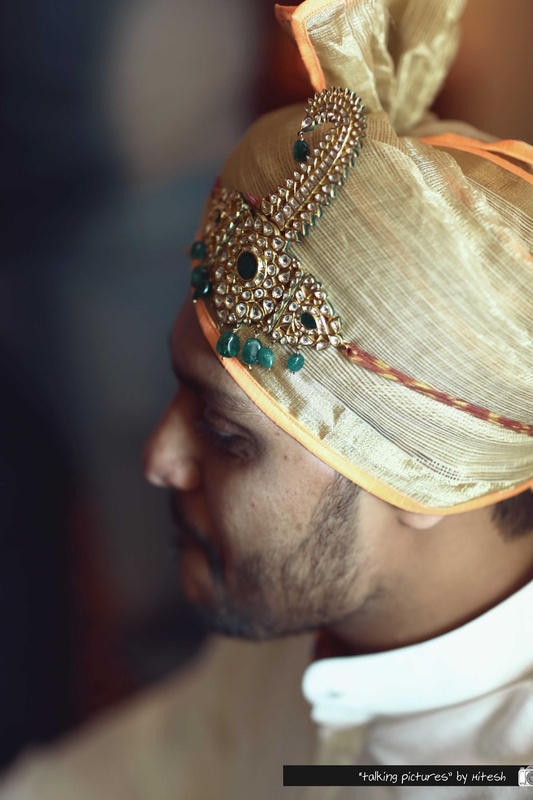 To complement his gorgeous bride, Karan wore a gold and white textured sherwani – together these two looked like true royalty!